Gulf of Mexico in 3D perspective. The Gulf of Mexico is the ninth largest body of water in the world. An ocean basin, it is bounded on the northeast, north, and northwest by the Gulf Coast of the United States, on the southwest and south by Mexico, and on the southeast by Cuba. This partially landlocked body of water, an indentation in the southeastern coast of North America, served as an avenue for discovery, exploration, and settlement of the southern and western sectors of what is now the United States as well as Mexico. Today, the Gulf serves a vital commercial role. It links the ports of five southern states and Mexico with the larger ocean. The basin is roughly circular in shape and approximately 810 nautical miles (1,500 km) wide. It connects with the Atlantic Ocean through the Florida Straits between the United States and Cuba and with the Caribbean Sea via the Yucatan Channel between Mexico and Cuba. Tidal ranges are extremely small due to the narrow connection with the ocean. Graph showing the overall water temperature of the Gulf between Hurricanes Katrina and Rita. Although Katrina cooled waters in its path by up to 4°C, they had rebounded by the time of Rita's appearance. The Gulf of Mexico's eastern, north, and northwestern shores lie along the U.S. states of Florida, Alabama, Mississippi, Louisiana, and Texas. This coastline spans 1,630 miles, receiving water from thirty-three major rivers that drain thirty-one states. The Gulf's southwestern and southern shores lie along the Mexican states of Tamaulipas, Veracruz, Tabasco, Campeche, Yucatán, and the northernmost tip of Quintana Roo. On the southeast it is bordered by Cuba. 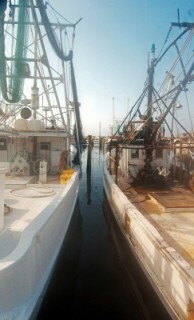 It supports major American, Mexican, and Cuban fishing industries. 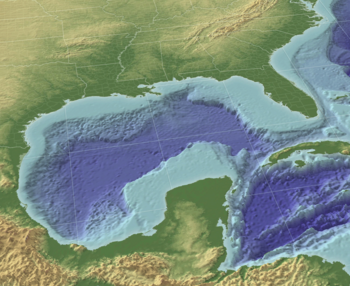 The outer margins of the wide continental shelves of Yucatán and Florida receive cooler, nutrient-enriched waters from the deep by a process known as upwelling, which stimulates plankton growth in the euphotic zone. This attracts fish, shrimp, and squid. River drainage and atmospheric fallout from industrial coastal cities also provide nutrients to the coastal zone. The Gulf Stream, a warm Atlantic Ocean current and one of the strongest ocean currents known, originates in the gulf, as a continuation of the Caribbean Current-Yucatán Current-Loop Current system. Other circulation features include the anticyclonic gyres, which are shed by the Loop Current and travel westward to where they eventually dissipate, and a permanent cyclonic gyre in the Bay of Campeche in Mexico, a major arm of the Gulf of Mexico. Additionally, the gulf's shoreline is fringed by numerous bays and smaller inlets. A number of rivers empty into the gulf, most notably the Mississippi River in the northern gulf and the Grijalva and Usumacinta Rivers in the southern gulf. 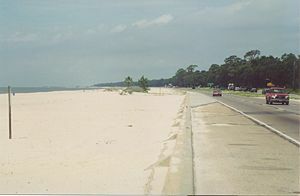 The land that forms the gulf's coast, including many long, narrow barrier islands, is almost uniformly low-lying and is characterized by marshes and swamps as well as stretches of sandy beach. The continental shelf is quite wide at most points along the coast, most notably at the Florida and Yucatán Peninsulas. The shelf is exploited for its oil by means of offshore drilling rigs, most of which are situated in the western gulf and in the Bay of Campeche. Another important commercial activity is fishing; major catches include red snapper, amberjack, tilefish, swordfish, and various grouper, as well as shrimp and crabs. Oysters are also harvested on a large scale from many of the bays and sounds. Other important industries along the coast include shipping, petrochemical processing and storage, military use, paper manufacture, and tourism. 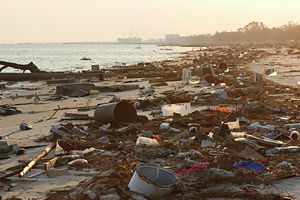 Because of the ever increasing amount of nitrogen and phosphates dissolved in the waters of the Gulf of Mexico, pollution has more than doubled since 1950. Current estimates suggest that three times as much nitrogen is being carried into the Gulf today compared with levels in the water thirty years ago or at any time in history. Every summer there is now an area south of the Louisiana coastline larger than the U.S. state of Massachusetts (at over 7,000 mi²; 18,000 km²) that is hypoxic. These waters do not carry enough oxygen to sustain marine life. This annually enlarging dead zone is a major threat to the fishing industry and to public health. New Orleans is located in southeastern Louisiana along the Mississippi River. The city is bordered by Lake Pontchartrain to the north and the Gulf of Mexico to the east. One of the oldest cities in the United States, New Orleans is known for its multicultural heritage as well as its music and cuisine and is considered the birthplace of jazz. Founded in 1718 by the French Mississippi Company, in 1763, the French colony was ceded to the Spanish and remained under Spanish control for forty years. Louisiana reverted to French control in 1801, but Napoleon Bonaparte sold it to the United States in the Louisiana Purchase two years later. During the War of 1812 the British sent a force to conquer the city but the Americans decisively defeated the British troops in the Battle of New Orleans on January 8, 1815. As a principal port, New Orleans had a leading role in the slave trade, while at the same time having the most prosperous community of free persons of color in the South. By the time Hurricane Katrina approached the city at the end of August 2005, most residents had evacuated. Although the hurricane's eye passed east of the city, the city's federal flood protection system failed, resulting in the worst civil engineering disaster in American history. The Mississippian culture was a mound-building Native American culture that flourished in what is now the Midwestern, Eastern, and Southeastern United States from approximately 800 C.E. to 1500 C.E., varying regionally. The Mississippian peoples were technologically comparable to the European Copper Age. The Mississippian way of life began to develop in the Mississippi River Valley (for which it is named). Almost all dated sites predate 1539-1542 (when Hernando de Soto explored the area), and very few European artifacts have been discovered at Mississippian sites, indicating that this culture dates almost entirely before European contact. A number of cultural traits are recognized as being characteristic of the Mississippians. Although not all Mississippian peoples practiced all of the following activities, all of them were distinct from their ancestors in their adoption of some or all of these traits. The construction of truncated pyramid mounds, or platform mounds. Such mounds were usually square, rectangular, or occasionally circular. Structures (domestic houses, temples, burial buildings, or other) were usually constructed atop such mounds. The adoption and use of riverine (or more rarely marine) shell tempering agents in their ceramics. The adoption of the paraphernalia of the Southeastern Ceremonial Complex (SECC), also called the Southern Cult. This is the belief system of the Mississippians as we know it. SECC items occur from Wisconsin to the Gulf Coast, and from Florida to Arkansas and Oklahoma. The Mississippians had no writing system or stone architecture. They could work naturally occurring metal deposits, but did not smelt iron or make bronze metallurgy. The Late Mississippian period, usually considered from c. 1400 to European contact, is characterized by increasing warfare, political turmoil, and population movement. More defensive structures are often seen at sites, and sometimes a decline in mound-building and ceremonialism. Although some areas continued an essentially Middle Mississippian culture until the first significant contact with Europeans, most areas had dispersed or were experiencing severe social stress by 1500. After the destruction and flight of the de Soto expedition, the Mississippian peoples continued their way of life with little direct European influence. Indirectly, however, European introductions would change the face of the Eastern United States. Diseases undermined the social order of many chiefdoms, while some groups adopted European horses and changed back to nomadism. Political structures collapsed in many places. By the time more documentary evidence is available, the Mississippian way of life had changed irrevocably. Other Native American groups, having migrated many hundreds of miles and lost their elders to diseases, did not remember that their own ancestors had built the mounds dotting the landscape. Mississippian peoples were almost certainly ancestral to the majority of the Native American tribes living in this region in the historic era. The historic and modern Native American tribes believed to have participated in the overarching Mississippian Culture include, among others too numerous to name: the Alabama, Apalachee, Caddo, Cherokee, Chickasaw, Choctaw, Creek, Guale, Hitchiti, Houma, Illinois, Kansa, Miami, Missouri, Mobilian, Natchez, Osage Nation, Quapaw, Seminole, Shawnee, Timucua, Tunica-Biloxi, Yamasee, and Yuchi. 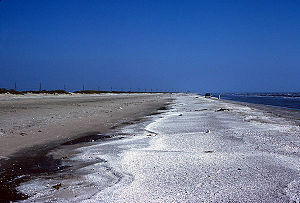 Gulf beach near Sabine Pass. Álvar Núñez Cabeza de Vaca (c. 1490 – c. 1557) was an early Spanish explorer of the New World. He and three others were the only survivors of the party of 300 men who landed near Tampa Bay, Florida, in the spring of 1528. Over the course of eight years, various members of the expedition succumbed to disease, starvation, exposure, and the arrows of various Native American groups as they slowly tried to make their way west, toward Mexico, where they knew there were other Spaniards. Others simply gave up and "went native." For a few years, the survivors were enslaved by various Native American tribes of the upper Gulf coast (including the Hans and the Capoques of Galveston Island. Only the final four—including Cabeza de Vaca—ultimately escaped and reached Mexico City. Traveling mostly in this small group, Cabeza de Vaca explored what is now the U.S. state of Texas. He traveled on foot along the Texas coast and up the Rio Grande and then down the Pacific coast to Sinaloa, Mexico, over a period of roughly eight years, during which time he lived in conditions of abject poverty and, occasionally, in slavery. During his wanderings, passing from tribe to tribe, he developed sympathies for the indigenous population. Cabeza de Vaca wrote about his experiences in a report for Holy Roman Emperor Charles V. It was later published in 1542, under the title La Relación (The Report), and is considered a classic of colonial literature. In 1539, Hernando de Soto launched the largest of the early Spanish colonial expeditions. A vast undertaking, de Soto's expedition ranged throughout the southeastern United States searching for gold and a passage to China. On May 8, 1541, de Soto became the first recorded European to reach the Mississippi River. De Soto died in 1542 on the banks of the Mississippi at present-day Lake Village, Arkansas. De Soto's excursion was, from his view and that of his men, a failure. They acquired neither gold nor prosperity and founded no colonies. Nonetheless, it had several consequences. De Soto was instrumental in forming the aggressive and hostile relationship between Native Americans and Europeans. More times than not, his expedition instigated the clashes they experienced. More devastating than the battles, however, were the diseases carried by members of the expedition. Several areas the expedition crossed were depopulated as a result. Many of the natives fled the populated areas struck by the illnesses toward the surrounding hills and swamps. The social structures of the population at the time were fundamentally changed. In the aftermath, Indians became itinerants to avoid diseases in population centers; their great nations, cities, and giant farms, all described by de Soto's people, no longer existed. De Soto's accounts were eventually dismissed by French and English pioneers, given the tremendous short-term changes that occurred. The de Soto expedition's descriptions of the North American natives are the earliest known source of knowledge on the societies in the southeastern North Americas. They are, in fact, the only European description of North American native habits before the natives encountered other Europeans. De Soto's men were, at the same time, the first and the last Europeans to experience the prime of the Mississippian culture. His expedition also created a claim on large parts of North America for Spain. ↑ US Environmental Protection Agency. General Facts about the Gulf of Mexico Retrieved December 20, 2007. ↑ A. Buckley. 1997. Dinosaur Extinction Page Retrieved December 20, 2007. ↑ US Environmental Agency. National Water Program Guidance: FY 2005 Retrieved December 20, 2007. ↑ Robert S. Weddle. July 20, 2001. Gulf of Mexico Texas State Historical Association. Retrieved December 20, 2007. ↑ NASA Earth Observatory. Warm Waters Provide Fuel for Potential Storms Retrieved December 20, 2007. ↑ Ray Russo. Earthquakes in the Gulf of Mexico Univ of Florida - Department of Ecological Sciences. Retrieved December 20, 2007. ↑ Elizabeth Carlisle. January 5, 2000. The Gulf of Mexico Dead Zone and Red Tides The Louisiana Environment. Retrieved December 20, 2007. Hudson, Charles. 1976. The Southeastern Indians. Knoxville, TN: University of Tennessee Press, ISBN 0870492489. PBS documentary The Conquistadors Site with map of proposed southern route through Texas and northern Mexico. History of "Gulf of Mexico"
This page was last modified on 20 July 2017, at 00:03.